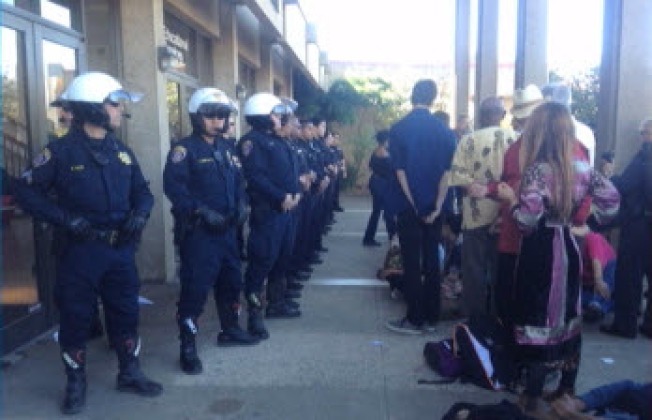 Two protesters were arrested during a March rally at City College of San Francisco. They've since filed suit. The City of San Francisco and City College of San Francisco were hit by civil rights lawsuits filed in federal court on Tuesday. A pair of students, 21-year old Otto Pippenger and 22-year old Dimitrios Philliou, said they were victims of excessive force applied by campus and city cops during a March 13 protest at the school, according to the San Francisco Chronicle. Pippenger claims that a cop broke his wrists, and Philliou claims injuries from a body-slam and unnecessary pepper-spraying, the newspaper reported. City and campus officials did not comment. The pair were part of a demonstration that sought to keep the school open, following a decision by its accreditor to remove the school's accreditation.